Established target at the Barambah Main Vein with resource calculations underway. Additional epithermal targets at Penwhaupell and Aranbanga prospects, with limited drilling completed to date. Wider region is underexplored and significant potential remains. 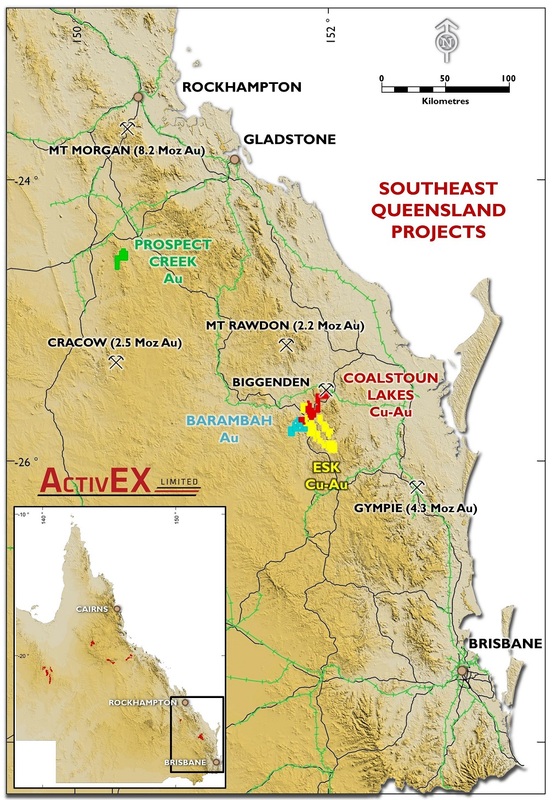 ActivEX’s Barambah Gold Project consists of one 100% ActivEX owned tenement (EPM 18732), one tenement under joint venture where ActivEX has already earned 75% interest (EPM 14937) and part of a third tenement that is also 100% ActivEX owned (EPM 16265).ed) structures. 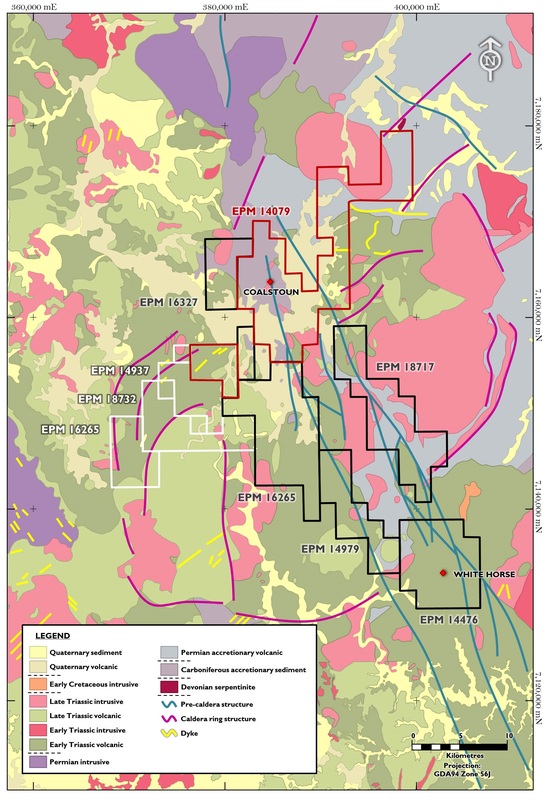 CSAMT profiling, indicates a favourable geological zone, 150 metres below current drilling may host significant mineralisation, marked by a horizon of conductivity. Repetitive vertical zones of mineralisation are well known in other deposits (e.g. Cracow and Pajingo) and could expand the deposit’s resource potential by a number of orders of magnitude. The conductive zone is ActivEX Limited’s highest priority exploration target. Outcropping, epithermal-style veins has also been identified elsewhere in the project area, namely the Penwhaupell and Aranbanga prospects. Exploration at these prospects has been limited to rock chip sampling, geological mapping, and a small amount of drilling, thus significant potential remains. Furthermore, the presence of three known, gold and silver veins within the project is a strong indication of the mineralisation potential of the system. The regional area remains under-explored, with very little work having been completed outside of the main prospects. Therefore, significant potential exists to locate additional mineralised veins. The Barambah Gold Project is located in south-east Queensland between the towns of Gayndah and Goomeri, 215 kilometres due north-west of Brisbane. The project is situated on the Maryborough 1:250,000 sheet (SG5606) as well as the Gayndah (9246) 1:100,000 sheet and is centred on latitude 25º 45’ 00”S, longitude 151° 46′ 00”E (Figure 1). The licence area is essentially freehold pastoral land used for cattle grazing. The majority of the Barambah Gold Project area consists of cleared plains with timbered hills to the east. Access to all areas is good, with sealed roads and well established station tracks. The project tenure comprises all of EPM 18732 (100% ActivEX), part of EPM 16265 (100% ActivEX), and all of EPM 14937 (JV, 75% ActivEX) with a combined total area of 108.24 square kilometres (Figure 2). A breakdown of grant date, expiry date, area, rent and expenditure commitments for each of the tenements is presented in Table 1. Note: EPM 16265 (Blairmore) was split into two areas based on geographical location, geological setting and target style. Specifically, the western sub-blocks that have been incorporated into the Barambah Gold Project, are highly prospective for epithermal style mineralisation associated with late Triassic volcanism. There have been several phases of modern exploration over the Barambah Gold Project. A summary of the historical exploration highlights is presented below. The deposit was first discovered by Newmont in 1981. Rock chip sampling returned 8.8 g/t Au and 27 g/t Ag, however Newmont did not continue work on the prospect because their exploration was focused on porphyry Cu-Au. Renison Goldfields Consolidated Ltd. (RGC) begun intensive local exploration in 1985. Encouraging rock chip results justified a mixed RC and diamond drill program which began in 1987, completing a total of 50 drill holes. Union Mining began open cut mining in 1992 to 1993 extracting 25,000 t of ore at an average grade of 2.7 g/t Au and 10 g/t Ag, equating to a contained total of 2,115.6 ounces of Au and 7,809.4 ounces of Ag. In 2005, Norton Gold Mine Pty Ltd calculated a non-JORC compliant underground, 20,000 t, Au-rich resource from historical data, grading at 5 g/t Au and 100 g/t Ag and a 144,000 t silver-dominant underground resource at a grade of 135 g/t Ag and minor Au. The prospect was discovered by Nedex in 1990 during follow-up mapping after stream sediment sampling. Nedex also completed rock chip sampling (up to 10.4 g/t Au and 147 g/t Ag), followed by drilling of one diamond and three percussion holes (up to 0.22 g/t Au and 59 g/t Ag). No other significant work programs have been completed at the prospect. 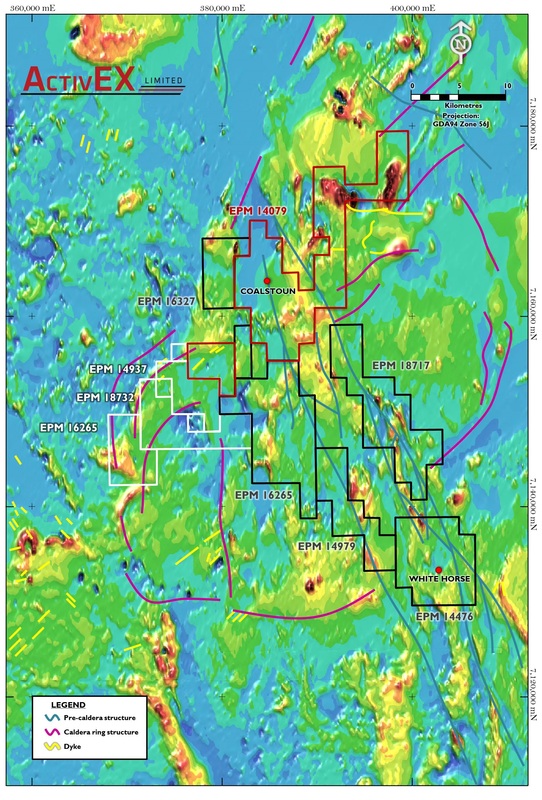 Nedex located a second area of epithermal veining at the Aranbanga prospect and completed mapping, rock chip sampling and stream sediment sampling, which returned up to 3 g/t Au and 16 g/t Ag. No drilling has been completed at this prospect. 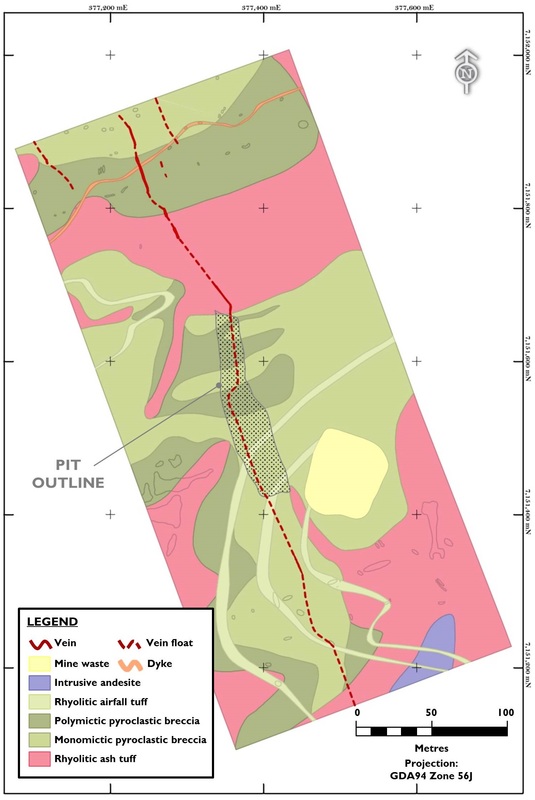 The Barambah Gold Project is located within the Silurian to Triassic Northern New England Orogen (NNEO), adjacent to the Perry Fault zone, a major NW trending structure that separates large structural blocks such as the Coastal Block and the Good Night Blocks from the Gympie Block and is host to the Mt Rawdon deposit, Coalstoun prospect and White Horse prospect (Figure 3). The structural blocks have been intruded by Permian to Middle Triassic granodiorites, monzonites and granites, some of which formed large volcanoes, erupting large volumes of andesitic volcanic debris into the Esk Basin (formerly Esk Trough), a large extensional basin consisting of marine sediments and andesitic volcanic to volcaniclastic units of early Permian to early Triassic age. Later granitoids developed during caldera related volcanism during the late Triassic, blanketing much of the earlier lithologies with rhyolitic volcanics which now cap many of the hills in the project area (Figure 4). The Barambah deposit consists of a number of gold and silver mineralised veins hosted by the Aranbanga Volcanic Group which consist of a number of polymictic to monomictic pyroclastic breccia, rhyolitic lapilli-ash tuff and rhyolitic airfall lapilli-ash tuff and lesser intrusive andesite. The veins are cut by quartz-feldspar phyric rhyolitic dykes, particularly to the north of historic mining (see Figure 5). Field observations, age relationships and regional geological dating, suggest an approximate age of ~220 ± 5 Ma for the deposit. The most heavily mineralised vein, the Main vein, has been the focus of ActivEX Limited’s exploration and typically ranges from 0.5 to 1.5 metres in width and outcrops over a 2 kilometre distance with an average strike of 330º and dip of 75º. High grade mineralisation extends from surface to more than 100m depth with grades up to 31.3 g/t Au and 3040 g/t Ag and is analogous in style to the Cracow and Pajingo deposits in QLD, Golden Cross and Martha Hill in New Zealand and Gosowong in Indonesia. The vein exhibits a variety of recognisable textures in surface hand specimens, including parallel and lattice bladed texture of silica after replacement of calcite; colloform and crustiform banding of quartz, chalcedony and amethyst as well as brecciation of wall rock and pre-existing vein material. Clasts of vein material may exhibit colloform banding and brecciation, suggesting a complex veining history. These textures extend at depth and may contain silicified clasts, rimmed by radiating comb quartz crystals, ranging from 0.2 to 2 millimetres in length with common zonal texture, marked by 1 to 4, alternating, zonal bands of varying fluid inclusion densities. Quartz, chalcedony, amethyst, opal (amorphous silica) and adularia are the dominant gangue minerals in surface hand specimens, often accompanied with cryptomelane and goethite which commonly accommodate silver and sometimes gold as adsorption mediums. At depth, chalcedony occurrence reduces and opal is not present, suggesting higher fluid temperatures to form crystalline quartz. Adularia is also present and has been identified via cobaltinitrite staining. Adularia is often associated with sulphides including pyrite up to 3mm in diameter and fine, dark sulphides (termed ginguro) which fill pre-existing vugs or pores left after adularia precipitation, suggesting precipitation after adularia. Ginguro under microscope reveals galena, sphalerite and chalcopyrite, often exhibiting a contemporaneous precipitation with each other and at times, seem to replace pyrite. Further, base metal sulphides may contain brecciated fragments of pyrite, suggesting precipitation of pyrite before base metal precipitation. Chalcocite and covellite may also be present in thin section, largely as rims around grains of chalcopyrite due to replacement via supergene oxidation. No gold or silver bearing mineral phase has been identified in the sulphide zone of the Barambah deposit. However, geochemical analysis has shown a marked decrease in gold and silver concentrations with decreases in base metal concentrations, suggesting that gold and silver may be held as fine inclusions within base metal sulphides ± pyrite and is further suggested by statistical correlations between base metal and Au-Ag concentrations. In the supergene zone, native gold has been identified in thin section. The alteration, geochemistry and mineralogical characteristics associated with mineralisation were thoroughly described and interpreted during honours research by ActivEX Project Exploration Geologist, Josh Leigh in early 2013. The study, as well as significant, tight spaced drilling, has allowed ActivEX to develop a strong understanding of the deposit’s architecture and mineralisation potential. 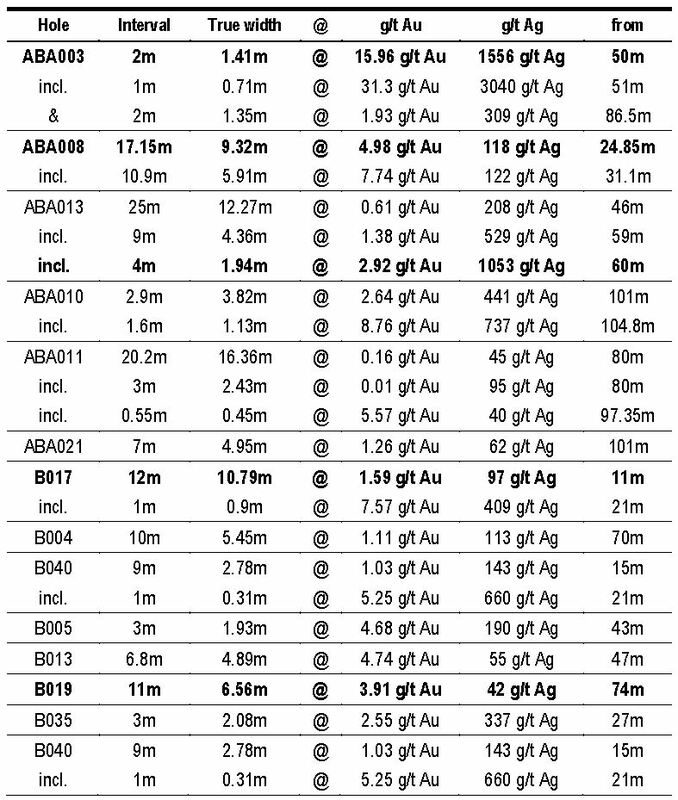 One ActivEX’ more recent discoveries has been the realisation that gold and silver mineralisation is critically dependent on a favourable geological unit, capable of allowing significant structural dilation to allow boiling of ascending, metal-laden fluids. 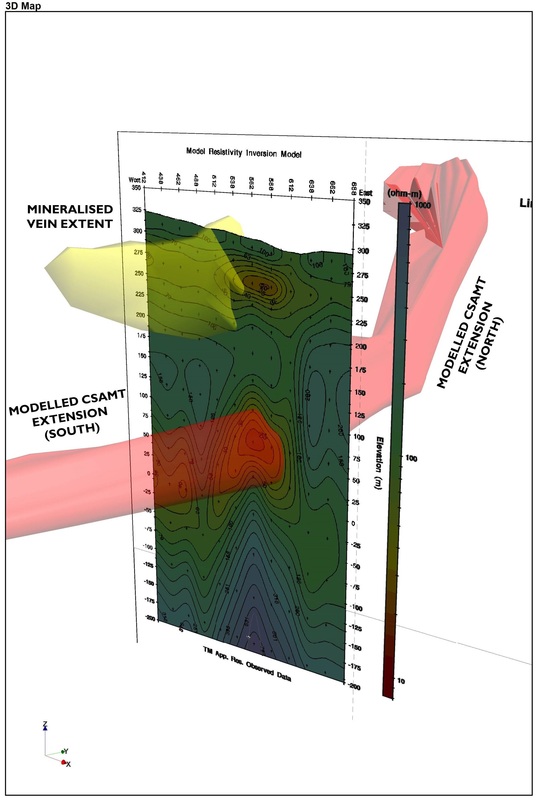 ActivEX Limited’s earlier CSAMT program, clearly show two structural blocks with contrasting resistivity responses with a bounding structure correlating with known veining at surface and in drill hole intersections. In areas of good mineralisation (e.g. ABA008), a conductive horizon is evident in CSAMT sections, corresponding to a package of pyroclastic breccia which has allowed structural dilation. Below this zone, fine rhyolitic lapilli-ash tuff restricts dilation and corresponds to a zone of high resistivity. The interpreted limit of the restrictive tuff at depth is marked by another horizon of conductivity and is believed to correspond to another package of pyroclastic breccia which may be favourable for structural dilation and to host mineralisation. Repetitive vertical zones of mineralisation are well known in other deposits (e.g. Cracow and Pajingo) and could expand the deposit’s resource potential by a number of orders of magnitude. The conductive zone is ActivEX Limited’s highest priority exploration target (see Figure 7). The western portion of the Blairmore tenement consists of two major vein-hosted Au-Ag deposits. The northernmost prospect, Penwhaupell, consists of a 1 – 0.5 metre wide quartz-chalcedony-opal-adularia vein which outcrops variably over a 2 kilometre distance, striking 40˚, with colloform banding and multiple brecciation textures. Rock chip samples have returned up to 16.2 g/t Au and 147 g/t Ag. The southernmost prospect, Aranbanga, is a ~0.5 metre wide quartz-adularia vein which outcrops over a distance of more than 1.5 kilometres, striking 100˚ with crustiform and colloform bands and common multiple brecciation with cockade textures, similar to that seen at the Cracow vein system. Surface rock chips have proved difficult to find the focus of mineralisation, although the hand specimen textures suggest a well evolved hydrothermal system. 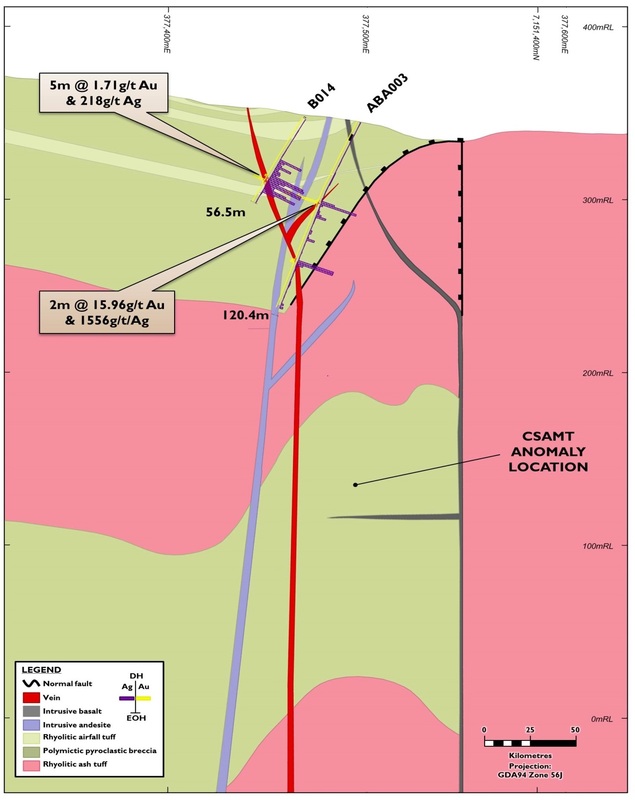 The One Mile tenement is highly prospective for vein-hosted Au-Ag mineralisation and contains the north-eastern extension of the Penwhaupell vein system, called Golden Chance. The prospect was discovered when initial field investigations by ActivEX Limited in 2012 revealed an outcrop of a ~0.5 metre wide, banded, bladed calcite vein with dark manganese oxide-malachite selvages. Assay results returned low Au (0.06 g/t max) but high Ag (95.8 g/t max), Cu (1.05% max), Pb (5.48% max) and Zn (2.98% max). The outcrop is along strike of the Penwhaupell vein-system and is interpreted to represent the roots of the hydrothermal system. The Barambah Gold Project is located in the New England Orogen, 215 kilometres due north-west of Brisbane in south-east Queensland. Furthermore, the presence of three known, Au-Ag veins within the project is a strong indication of the mineralisation potential of the system. The regional area remains under-explored, with very little work having been completed outside of the main prospects. Therefore, significant potential exists to locate additional mineralised veins.